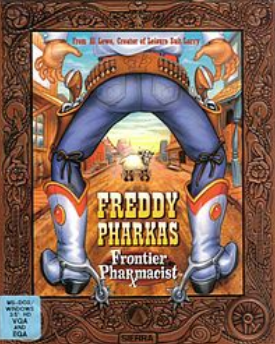 Freddy Pharkas: Frontier Pharmacist is an old-west comedy adventure game. Freddy Pharkas must discover who is scaring away all of the land owners in Coarsegold and put a stop to it. Freddy Pharkas: Frontier Pharmacist is now supported by ScummVM, a program designed to let 2D adventure games run on multiple platforms. With ScummVM, Freddy Pharkas: Frontier Pharmacist now runs on modern versions of windows, as well as Linux, Mac OS X, and many consoles such as Dreamcast, Wii, PlayStation 2, and PlayStation Portable. For a complete list of platforms supported by ScummVM, see here.